We here at International ___ Day have our fingers on the pulse of American culture. Not ones to take advantage of scantly clad women, like those attention whores at the Monkey Barn, we are serious about maintaining our journalistic credentials through solid reporting and family-friendly photos. 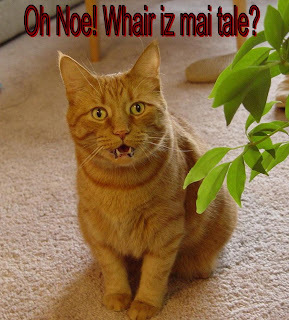 Thus we would like to celebrate today as the first ever International lolcat Day. Now what IS an lolcat? It's a cute picture of a cat, with a funny/absurd/weird caption. The most famous lolcat is HappyCat who stunned the world with a simple question. So, hang out with some lolcats today. You'll smile all the more for it! I'm in ur internationalz day, levin u commentz. inturnashinul lolcat dai iz full of win and awesum. I gotz ur tale rite hur! Many LOLz for U Dragn! Oh hai! I'm in ur interwebs, waistin taiem wif lolcats! Procrastination cat is teh best.